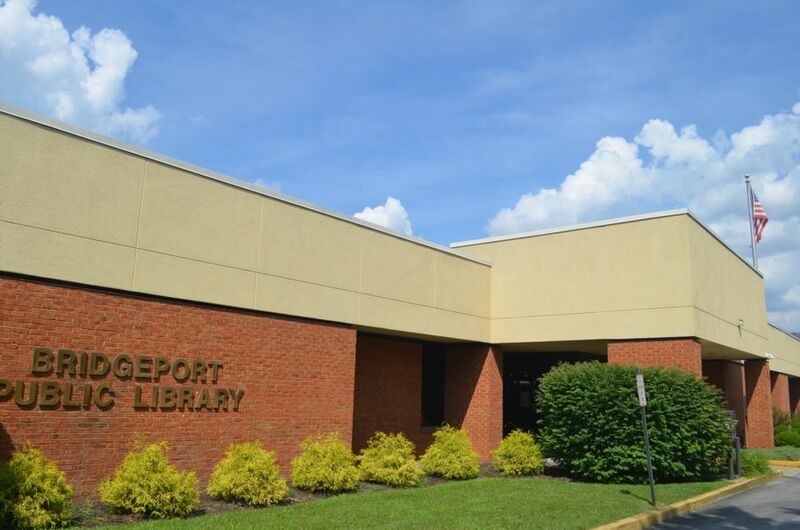 Renovations began last week at the library. 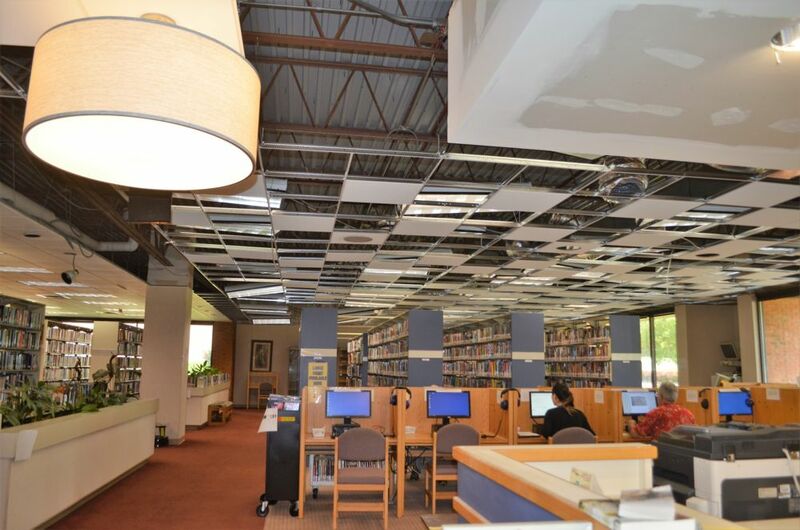 They are starting with the front section of the library and are currently replacing the ceiling grid, tiles and lighting. If you come in the front entrance, you will already notice some major new light fixtures. Since they are working over the front circulation desk, we have had to remove most of the computers, so you need to check out your books in the back section of the library. When possible, we will have a working computer at the front desk, but that is dependent on work schedules. 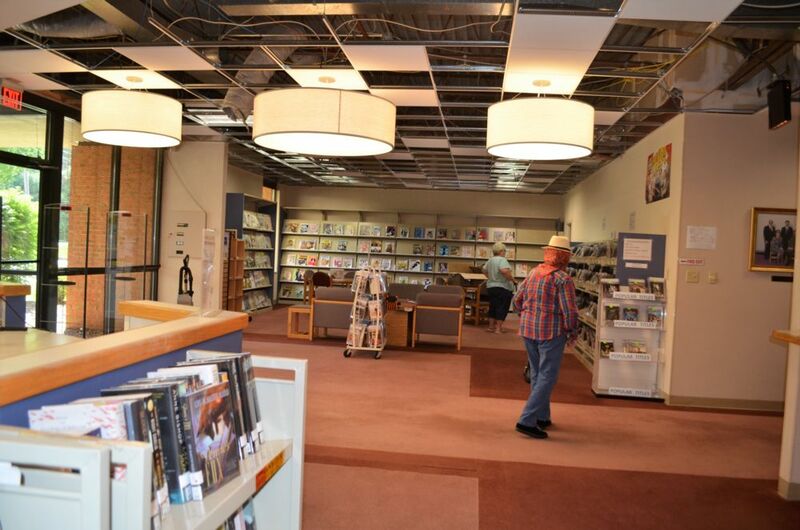 The book stacks, magazines, and DVDs remain accessible in the front until they start replacing the flooring. When that happens, the new books, DVDs, magazines, Internet computers will all have to be removed for a short period. So, services in the front section will be hit or miss for the next few weeks. The front should be completely done in around 4-5 weeks when they will move onto the center section. Since they will be placing a section of electrical and Internet access under the center tables, this will be a messy part of the construction, but when it is completed, you will be able to plug your laptops or other devices into the floor panel under those tables. The back section should get started in late August to early September and then they will complete the project with the hallways and conference room. It has been a long wait, but everyday it looks a little different so don’t be surprised next time you visit.